I see myself sitting on the front porch and the mailman approaching with a big sack of fan letters. Readers around the world will try and figure out what I look like, what I do in real life, and where I live. I'll sit, rock, and laugh. Then, I'll go write my next book. Now, that answer seems silly. Facebook came around. Twitter became a thing. Instagram has all of us documenting our life through pictures. "Published" no longer is a title honored to an elite group of people who survived agents, publishers, editors, and came out scarred but alive to tell our stories. I didn't know all of that would happen at the beginning of my career, of course. Last night, I realized that how I pictured the results of my career are gone. Social media isn't going anywhere. My life is a semi-open book. Self-publishing is common, and anyone can claim the word published. People, not publishers, changed the rules and there are free books, $.99 books, subscription services, and more books (vetted and unvetted) in the world that "your time to shine" only lasts as long as you can type the words "It's live!". As quickly as the downfalls of stripping off those grandiose epitomes hit me, I realized that it wasn't success that I had looked forward to during those early years. That the rank I eluded to back then had taken a different form and was obtained privately, anonymously, and on the front porch where I sat, rocked, and laughed. All of that had happened and was celebrated within the elite group of published authors, editors, agents, and publishers I got to know throughout the years. The authors who had books published at the same publisher when I celebrated my 1st release to my 50-something* release became my support network. They became my friends off of social media. The years of brainstorming, sharing frustrations, and celebrating each other's achievements have created that select group of published authors I am a part of. I have been there as they got married, divorced, had babies, became grandparents, and hit every publishing list out there. Somehow, our lives went from coworkers to friends. The talk behind the scenes with my publishers, editors, and agent went from choices, advice, cries of help, to what we're having for dinner, what they want for Christmas, and how our kids are doing. This status I've achieved wouldn't be possible without readers from all over the world, purchasing my books. Instead of mailed letters (though I do get a few! ), I've enjoyed emails, private messages, and comments. Even the simplest click of a "like" button from a reader brings a smile to my face. I never had an inkling at the start of my career how gracious, kind, and loving readers could be. It's humbling, and it's exactly what I had wished for. Those are the highlights of my career. That's my success. Everyone deserves to have their own version of sitting, rocking, and laughing. Don't be surprised if your end goal changes through the years, it'll still feel just as sweet. 57th book, you’re awesome and I’ve read every flipping one of them. Please don’t ever stop what you were meant to do. Not everyone can have that said to them. 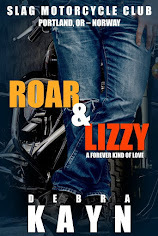 Loved Roar and Lizzie. Am anxiously awaiting the next one '!!!!!!!!!!!!!!! Thank you so much for reading all the books and for such kind words. It won't be long until the next book!